Are Turkey’s Christians as 'fine' as they say? News: Are Turkey’s Christians as 'fine' as they say? 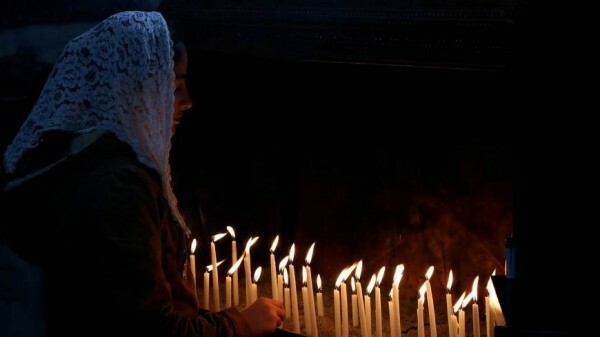 A Christian worshipper lights candles following a mass on Christmas at the Virgin Mary Syriac Orthodox Church in Diyarbakir, Turkey, Dec. 25, 2017. REUTERS/Sertac Kayar. Leading the signatory list was Greek Orthodox Ecumenical Patriarch Bartholomew I of Constantinople, whose community has been waiting for 47 years now to have its theological school reopened, followed by Archbishop Aram Atesyan, the acting spiritual head of the Armenian community, which is unable to elect its own patriarch because of government interference. Fourth on the list was Yusuf Cetin, the acting patriarch of the Syriac community, which has seen many of its church properties seized by the state, while most other signatories represented foundations crippled by red tape. What led minority leaders to issue such a statement at a time when their misgivings are known to be on the rise? Tuma Celik, a Syriac community leader who became an HDP deputy in the June elections, told Al-Monitor that church and foundation leaders were asked to make the statement to counter the negative reverberations of Brunson’s detention. The request came from the Turkish state via a channel within the non-Muslim minorities. As community representatives discussed the request a day after it was communicated, presidential spokesman Ibrahim Kalin invited them to a meeting scheduled for two days later. The leaders could not bring themselves to go to the meeting without fulfilling the request and issued the statement. The meeting with Kalin took place in Istanbul the following day. According to the lawmaker, the declaration was aimed at the international public amid the escalating row over the pastor’s detention. “President Recep Tayyip Erdogan openly took advantage of the declaration even before the ink on it was dry,” he said. The Armenian community’s Agos newspaper opined that the declaration was meant as a response to US Vice President Mike Pence’s description of Brunson as a “victim of religious persecution” during an international gathering on religious freedoms. “Yet [the message of] such declarations is understood not as ‘We are under no pressure’ but rather as ‘We’ll be in trouble if we don’t sign,’” Agos reported. For Rober Koptas, an Armenian writer and publisher, the declaration was a public relations attempt by Ankara over the Brunson affair. At a time when religious minorities have a long list of grievances and “all sorts of discrimination persists, such declarations illustrate only the mangle in which those people are squeezed,” Koptas told Al-Monitor. The Justice and Development Party “has chosen the very path that befits oppressive regimes, using its power to further crush the minorities, which are already just a handful of people,” he added. Though their leaders claim to be “fine,” Turkey’s non-Muslim minorities are going through “bad times” again. Out of safety fears, individuals are increasingly seeking refuge in the West, while institutions face interference in their internal affairs and dispossession attempts. Property usurpation is the most poignant problem. Under a 2012 legal amendment, many villages in Turkey were incorporated into cities as neighborhoods, which opened the door to new property seizures, a problem that has long haunted non-Muslim communities. In 2016, Syriac properties such as churches, monasteries, cemeteries and land registered to village legal entities in regions such as Mardin, Midyat and Nusaybin were transferred to the Treasury. A liquidation commission was supposed to sort out church properties and return them to the Syriacs, but the authorities did not keep their promise. Moreover, the churches, monasteries and cemeteries were handed over to the Religious Affairs Directorate (RAD), a government body dealing with Muslim affairs. Due to the outcry that followed, the decision was retracted, but the properties went back to the Treasury. The ensuing legal and political efforts secured the return of 56 properties. Despite Erdogan’s pledges, the Mor Gabriel Monastery, a 1,600-year-old Syriac icon near Midyat, failed to retrieve 18 out of 30 properties. According to Celik, the returned properties include churches, monasteries and cemeteries, while agricultural lands remain with the Treasury. Another problem stems from legal machinations that are paralyzing minority foundations. In 2013, Ankara scrapped a bylaw regulating the election of administrative organs at such foundations, but a new one has yet to be issued. As a result, the foundations are unable to hold elections to fill positions vacated by deceased, sick or resigned members, which is effectively disabling them. A fresh controversy coincided with the declaration. The authorities allocated a first-degree protected area and a historical building on Istanbul’s Heybeliada Island to the RAD. While the Orthodox theological school on the island remains closed, the RAD is planning to build an Islamic education complex nearby. The theological school, founded in 1844 to train clergy for Orthodox churches across the world, closed its doors in 1971 due to legal restrictions on private higher education institutions. Efforts to reopen the seminary have turned into a political saga, with the European Union and the United States also stepping in at times. In this context, the RAD’s project not only flouts Christian sensitivities but also rings like a religious score-settling. As a result, minority members, especially the young, are increasingly looking for new lives abroad. The number of those leaving has notably increased in the aftermath of the 2016 coup attempt. In the case of the Syriacs, Celik said some 5,000 people are currently living in their ancestral lands in southeastern Turkey and that 10% of them had returned from Europe in the 2000s. “They had rebuilt their homes and started new lives, but some of them — approximately 80-100 people — have gone back to Europe already. The state of affairs is scaring them,” Celik said. In sum, the government is making life tougher in many aspects for non-Muslim minorities, while generously smoothing the way for Islamic entities. To stay clear of trouble, minority members — a handful of remnants — feel compelled to assert they are “fine,” but they are not.